August 25, 2017 August 24, 2017 Amanda B. 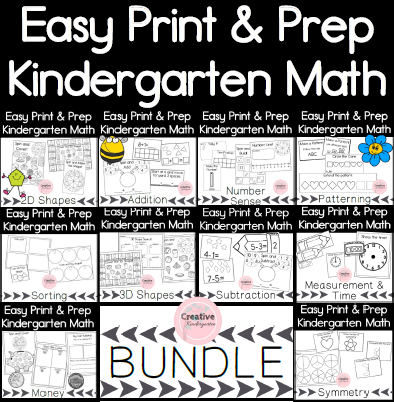 The newest activity pack has been added to the Easy Print and Prep Kindergarten Math Centers bundle. These hands-on activities will reinforce students’ knowledge about measurement and time. It contains 5 activities to work on these skills with different materials. There is a measure around the room activity that students can use around the classroom. These pencils can be used to compare length and width. Students can use non-standard measuring tools to measure each of the pencils, compare them, and place them in order. This fun art activity allows students to draw a picture of anything they want, and measure it. They must select an appropriate non-standard measuring tool, and use the appropriate language to write their answer. Show the Time gives students the chance to practice showing time to the hour. They pick an analogue clock and then use the clock work mat to show the time. I cut some popsicle sticks to make them look like the hands of a clock, but these would work great with play dough too! This next activity has students practice reading time from a clock and writing out the time. Laminate these and students can use white board markers, or number magnets.